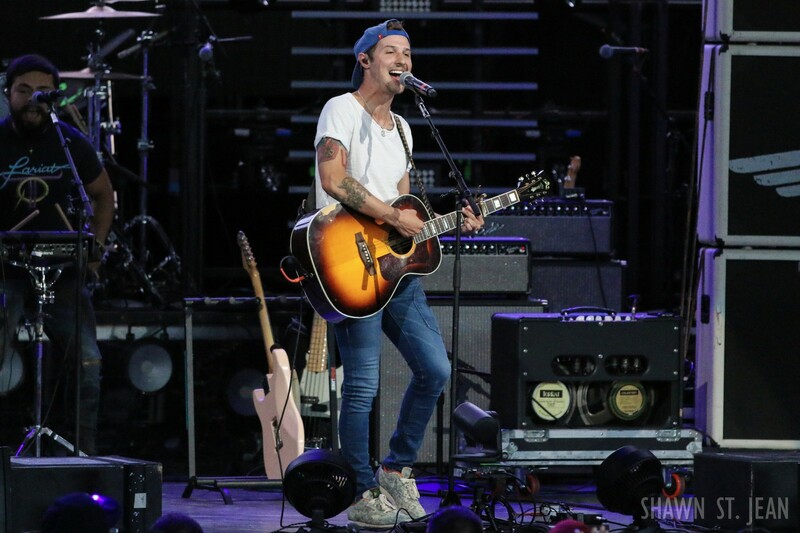 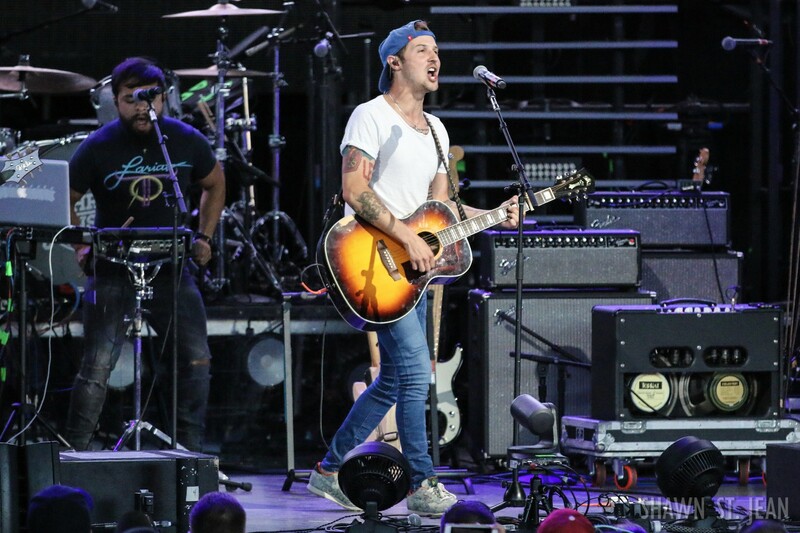 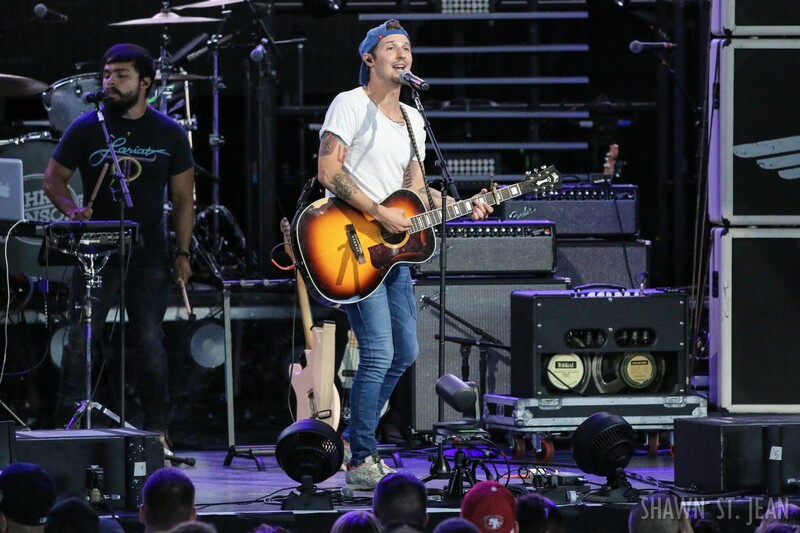 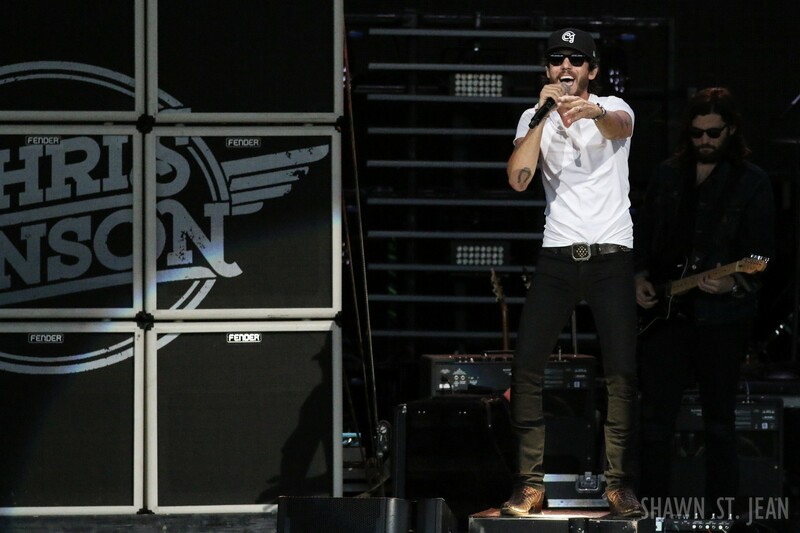 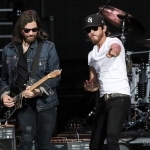 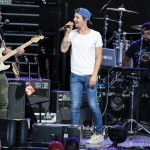 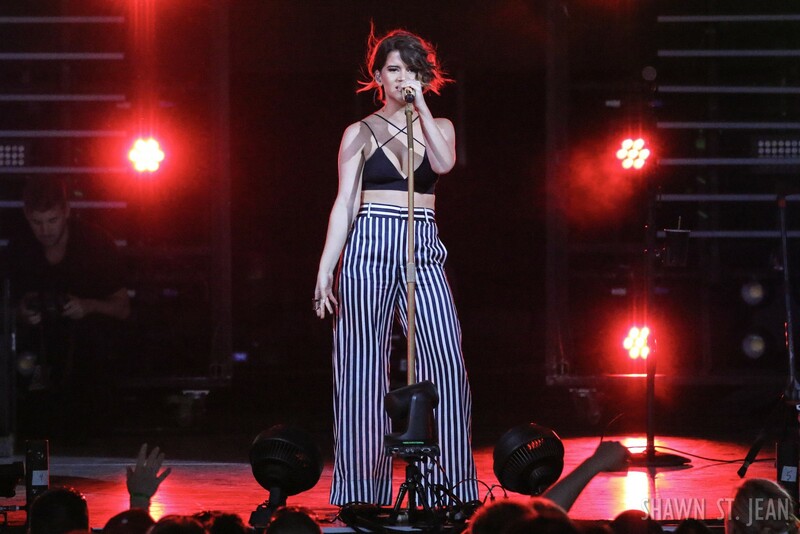 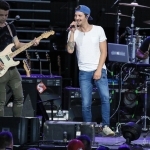 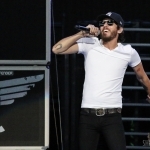 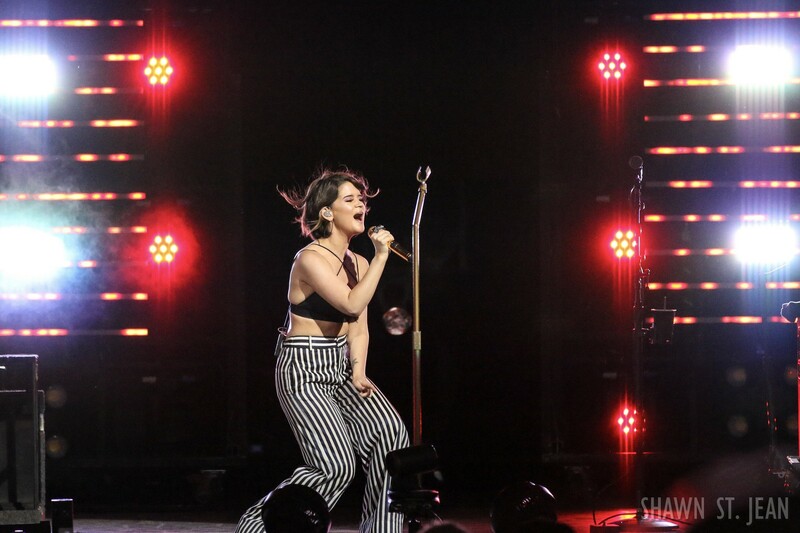 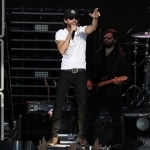 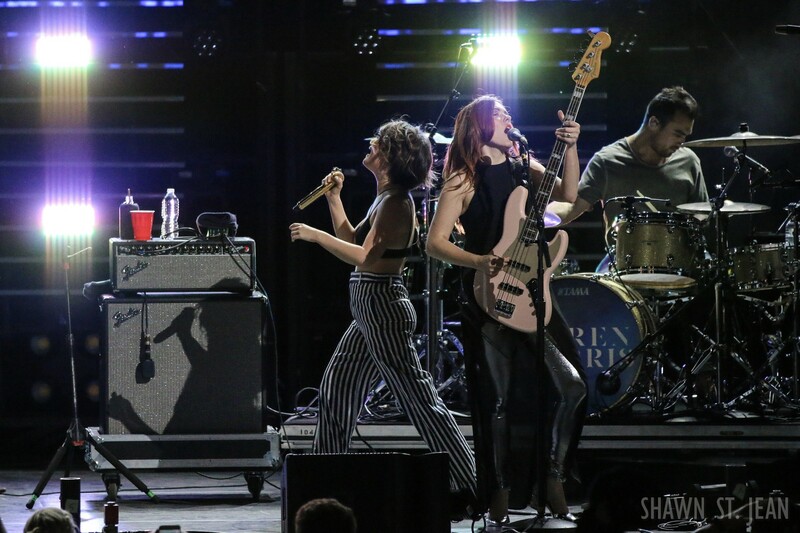 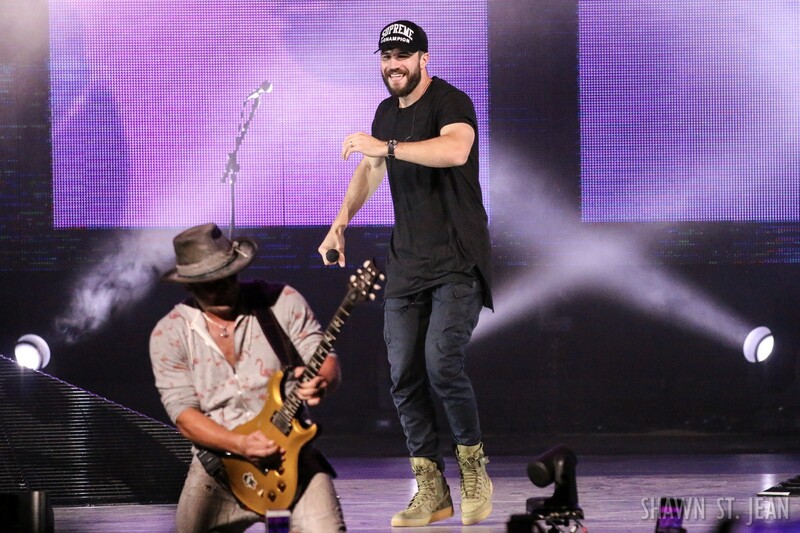 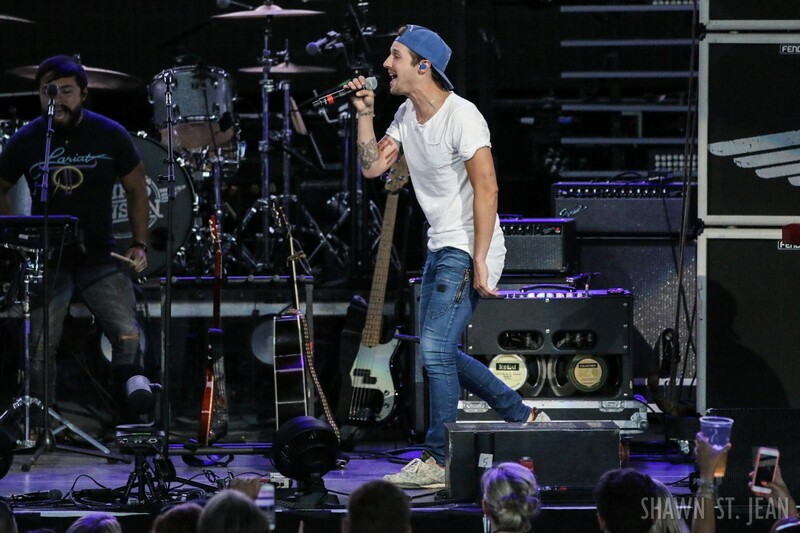 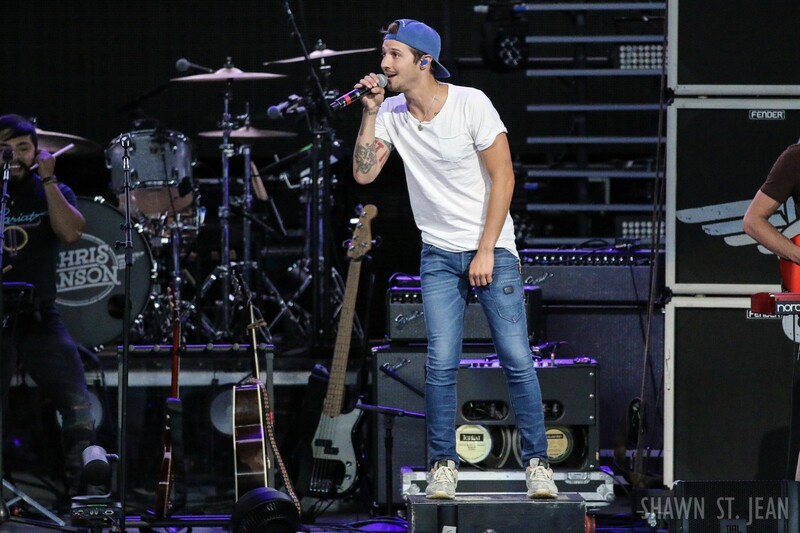 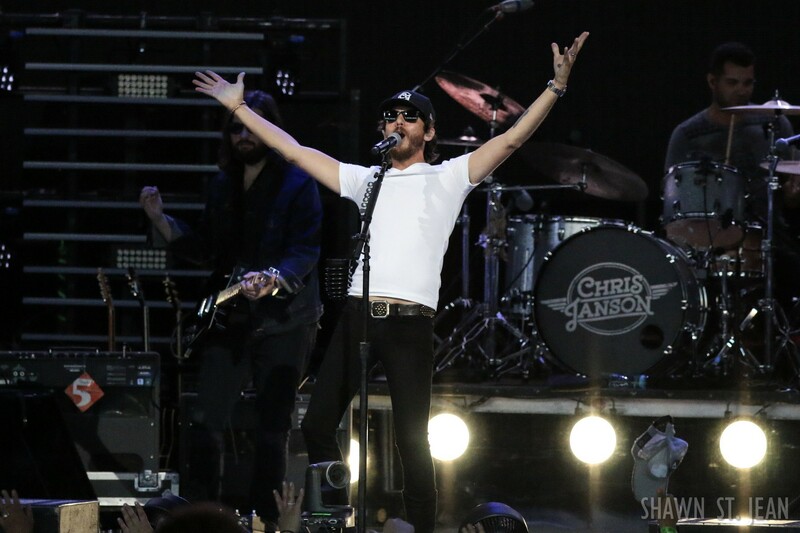 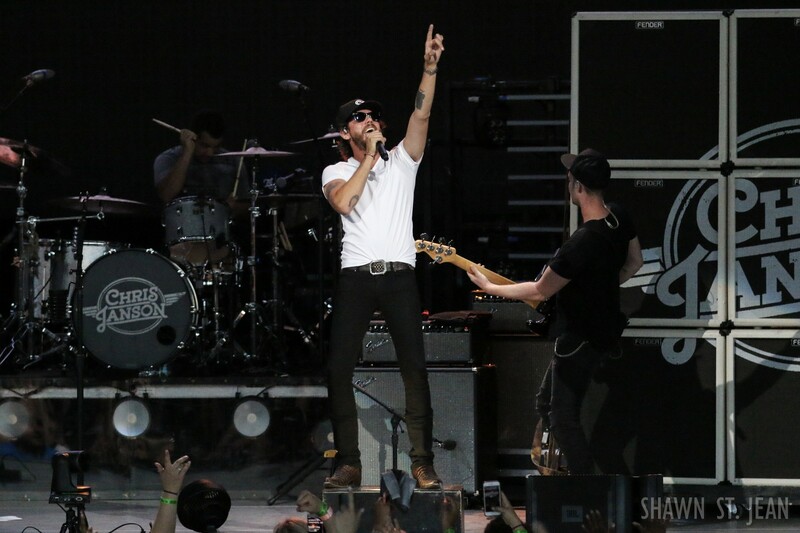 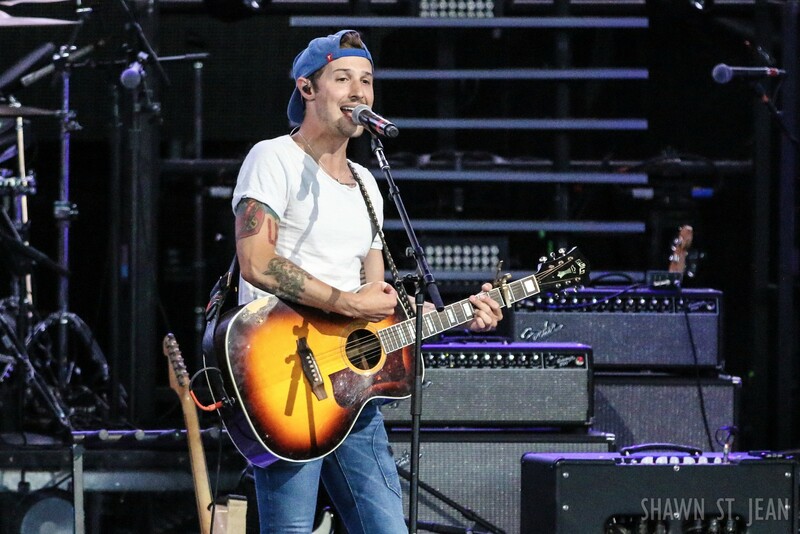 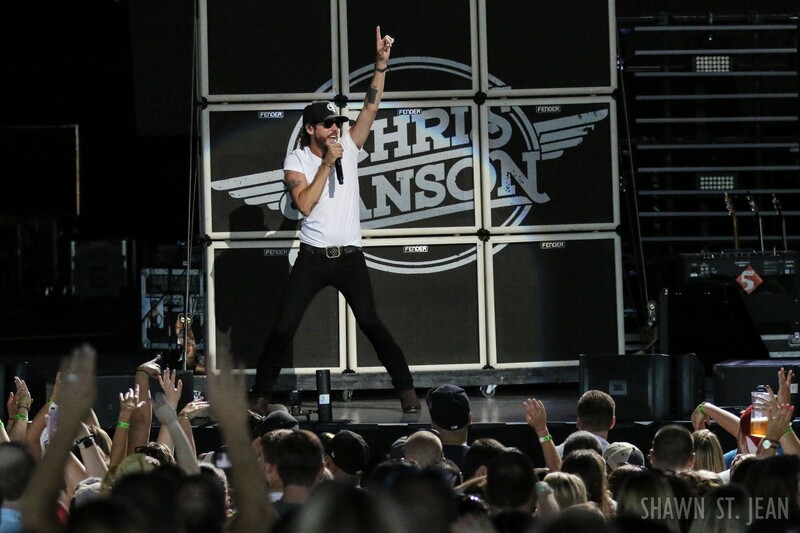 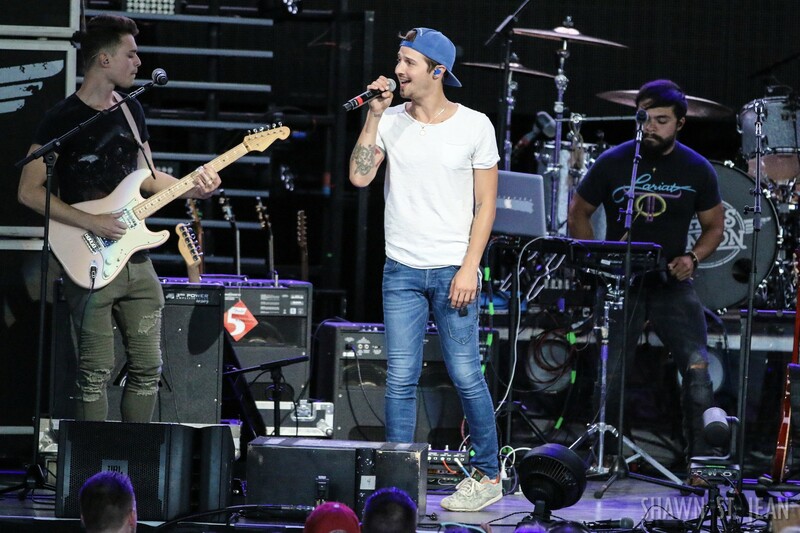 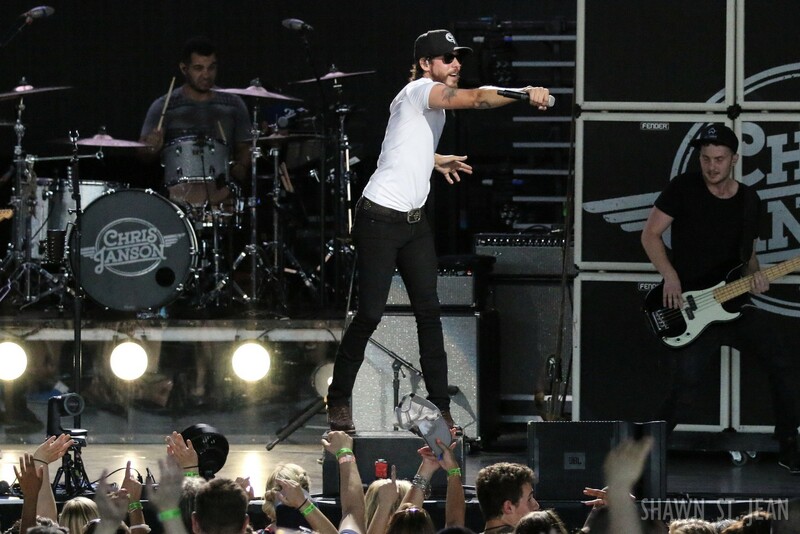 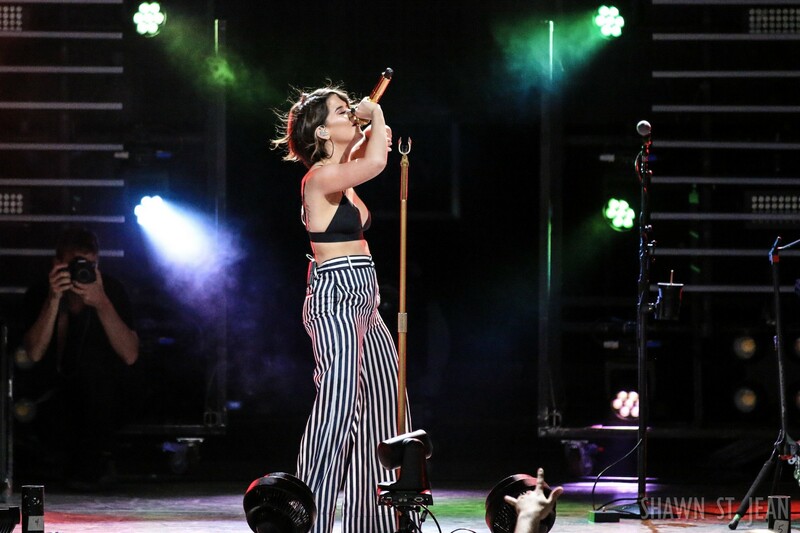 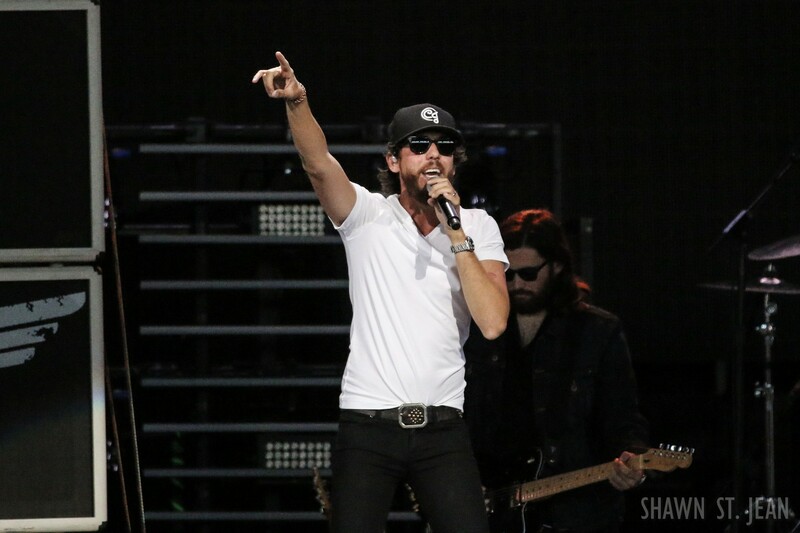 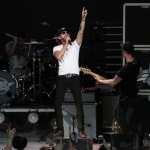 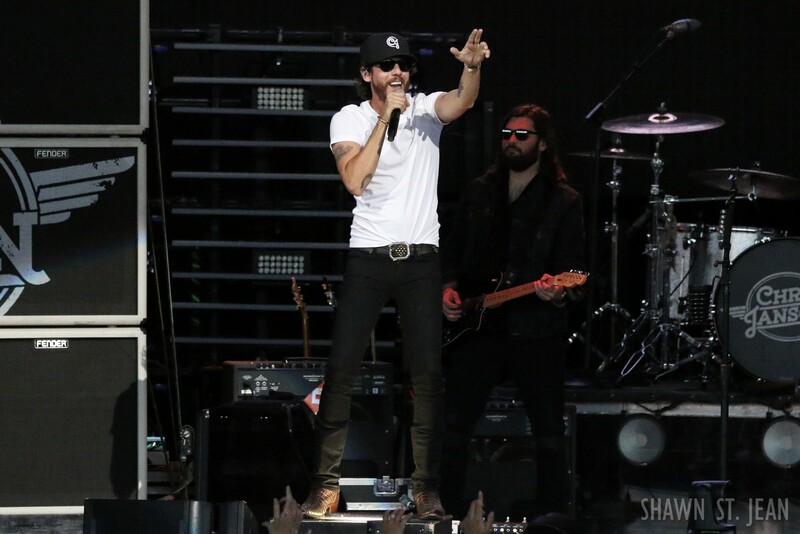 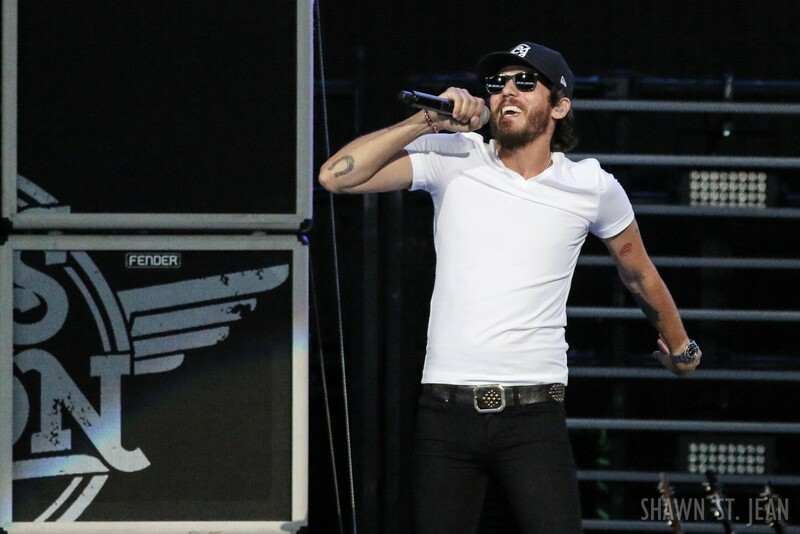 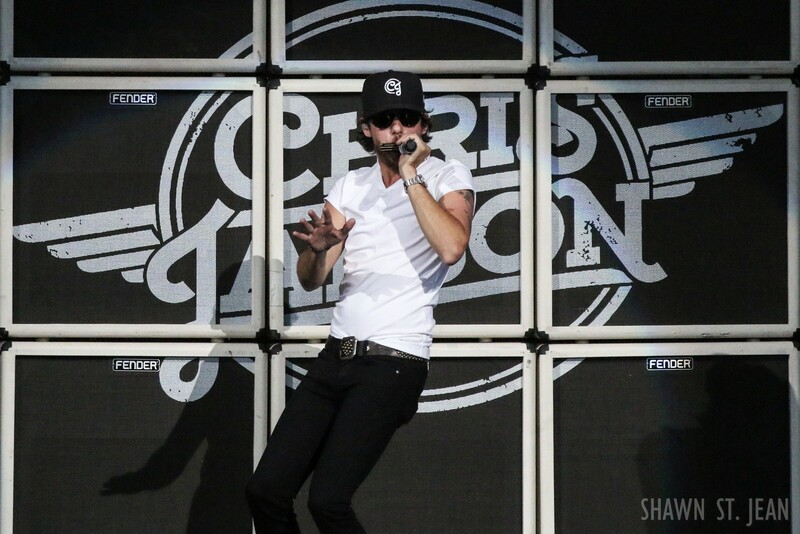 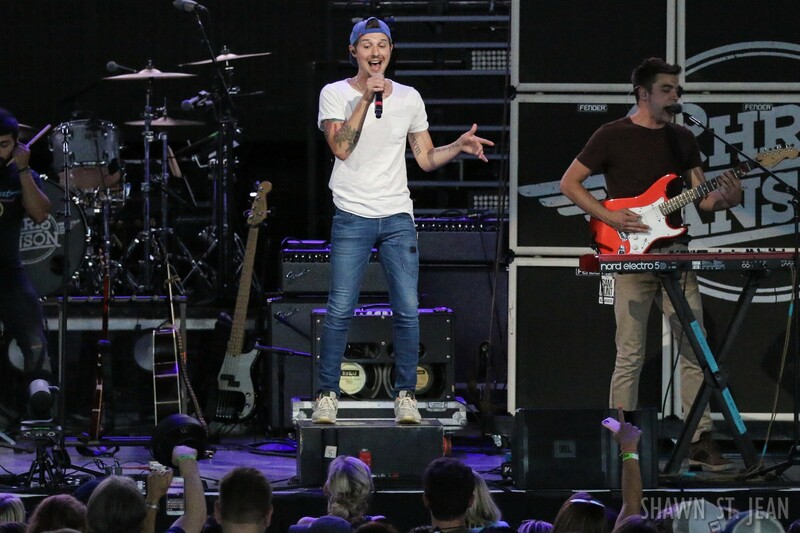 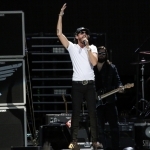 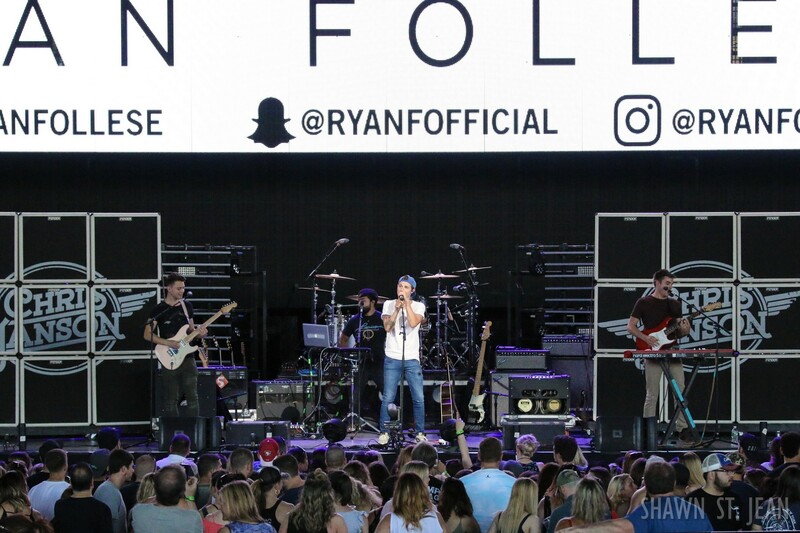 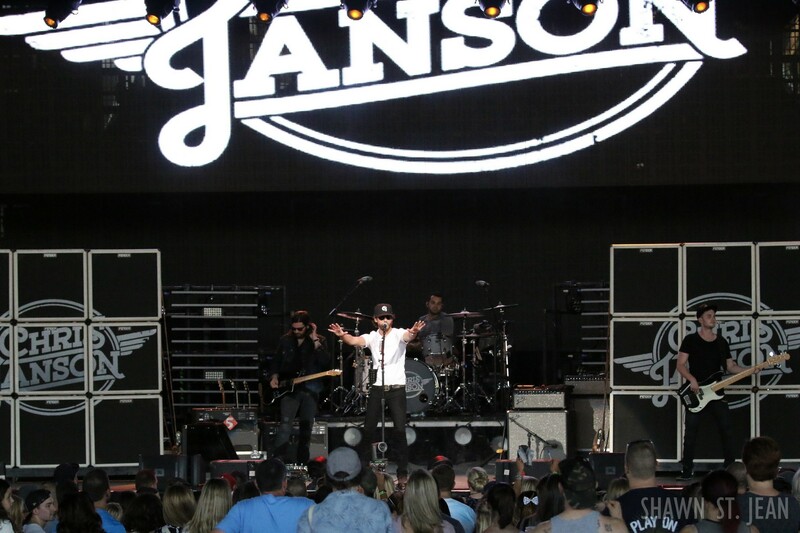 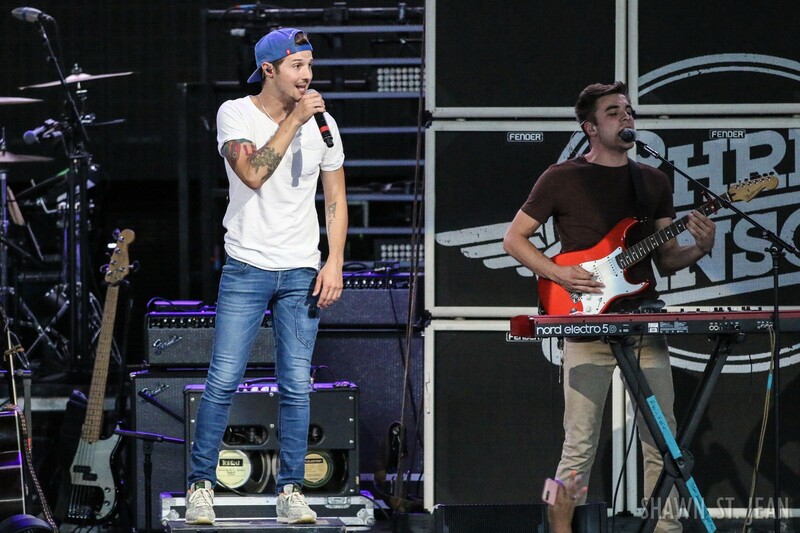 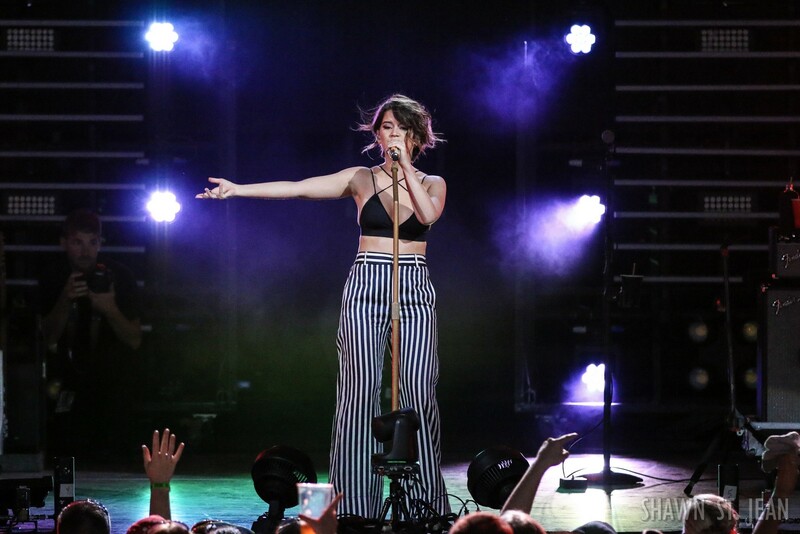 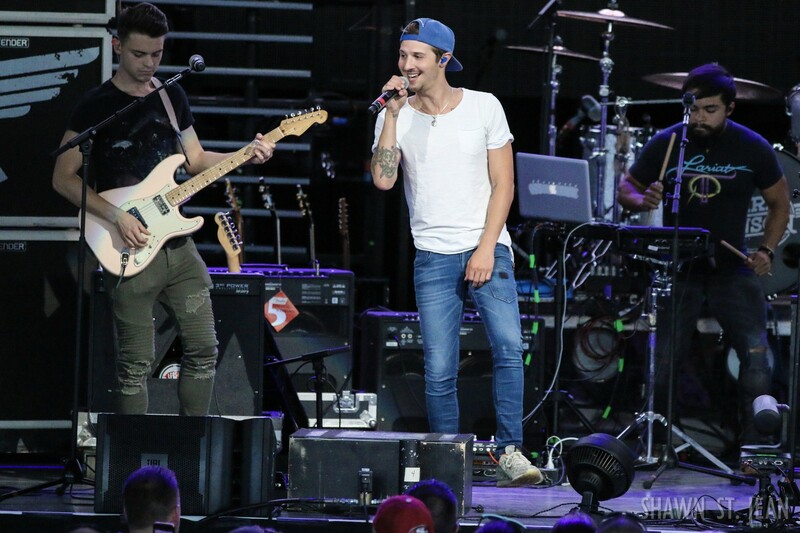 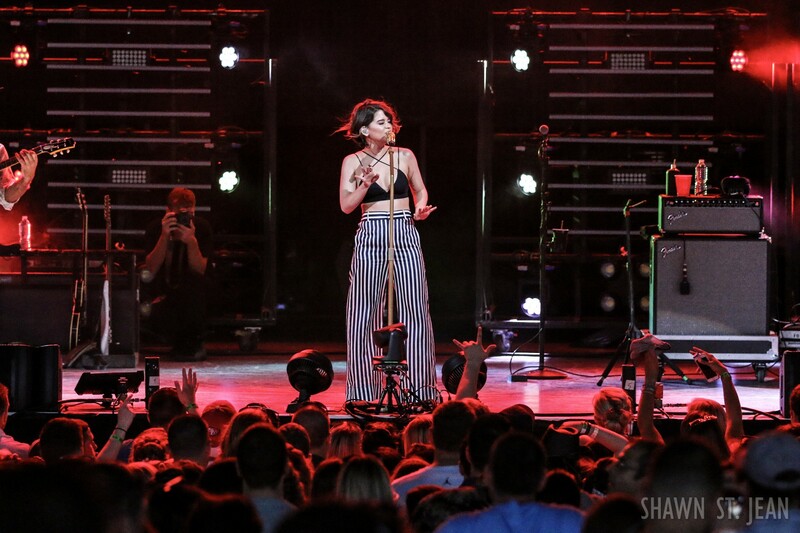 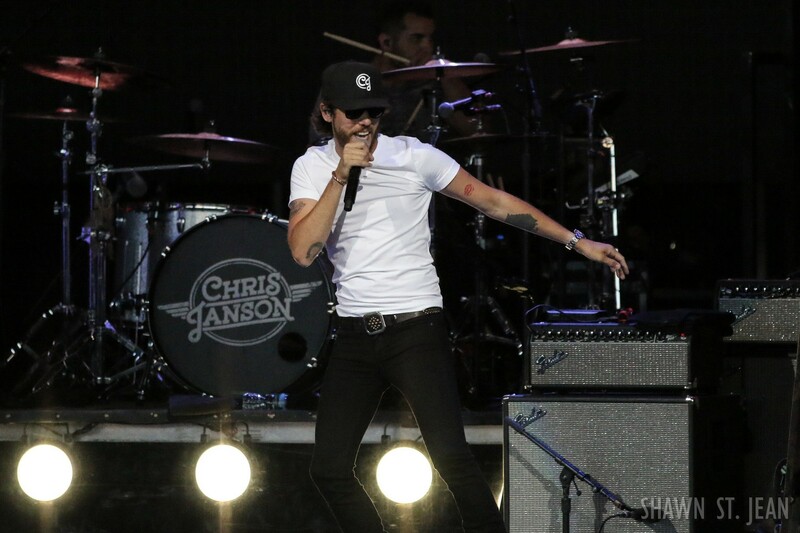 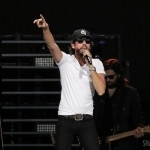 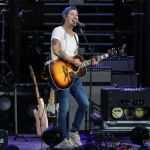 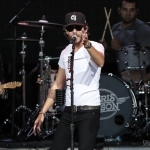 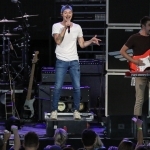 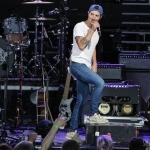 Maren Morris, Chris Janson and Ryan Follese joined Sam Hunt at Hartford's Xfinity Theatre on the 15 in a 30 Tour. 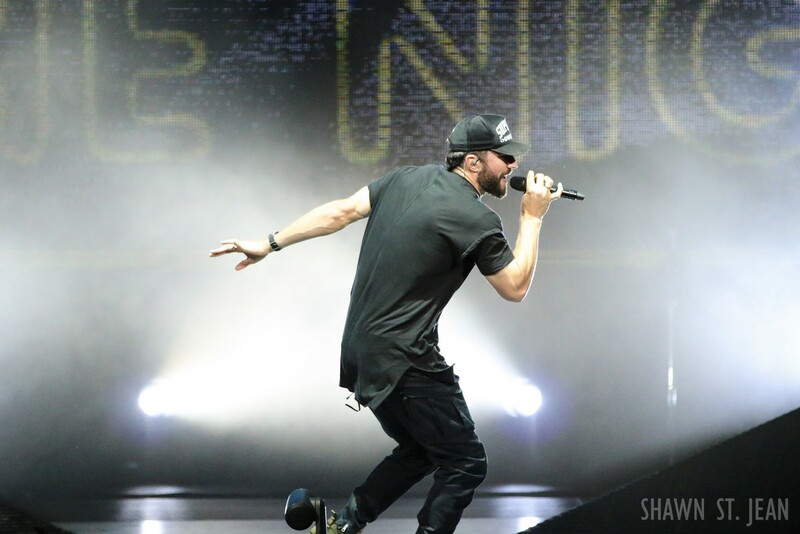 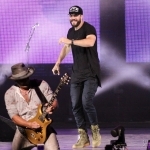 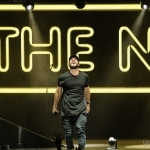 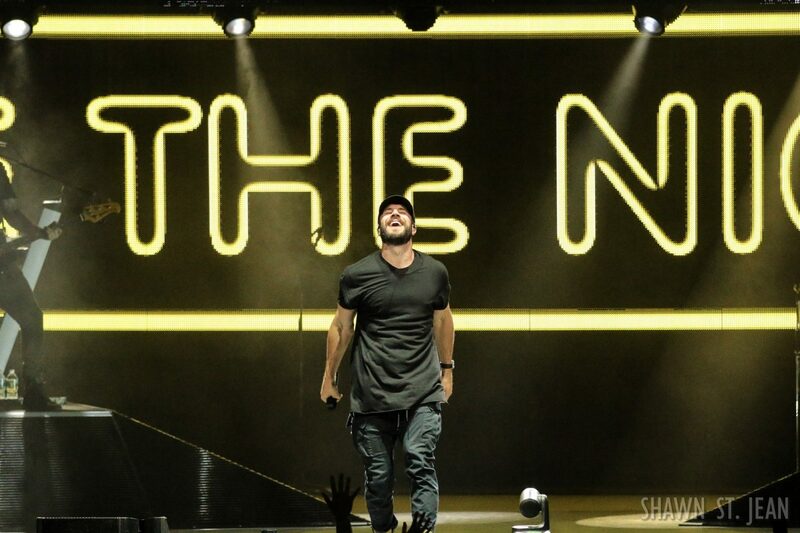 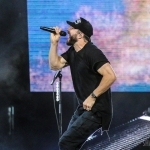 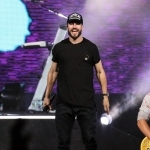 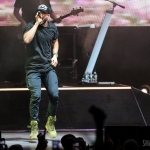 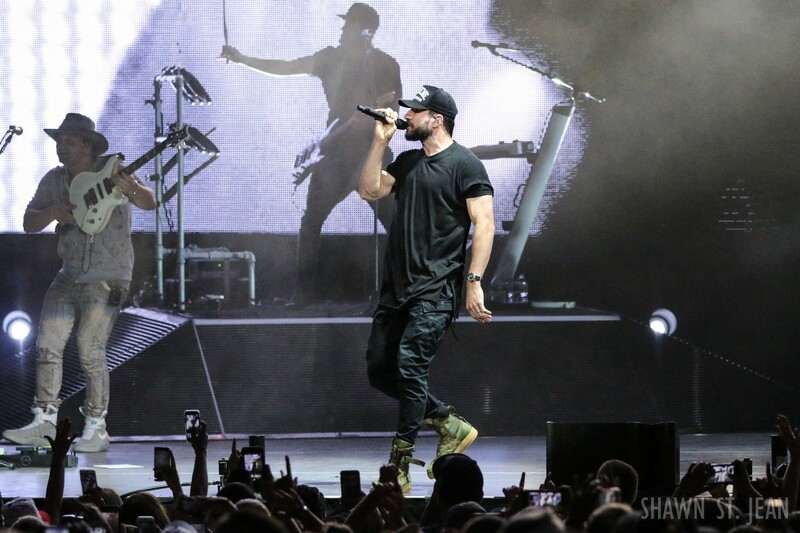 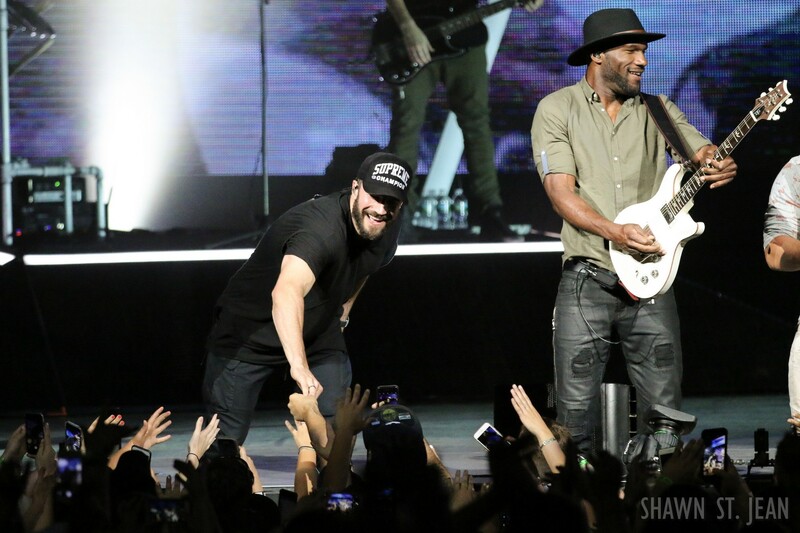 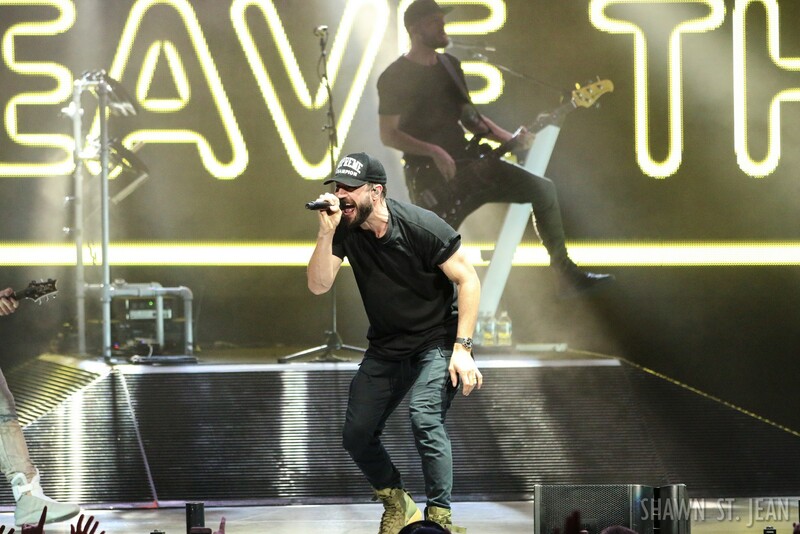 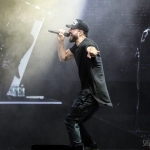 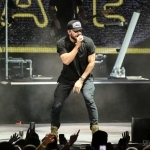 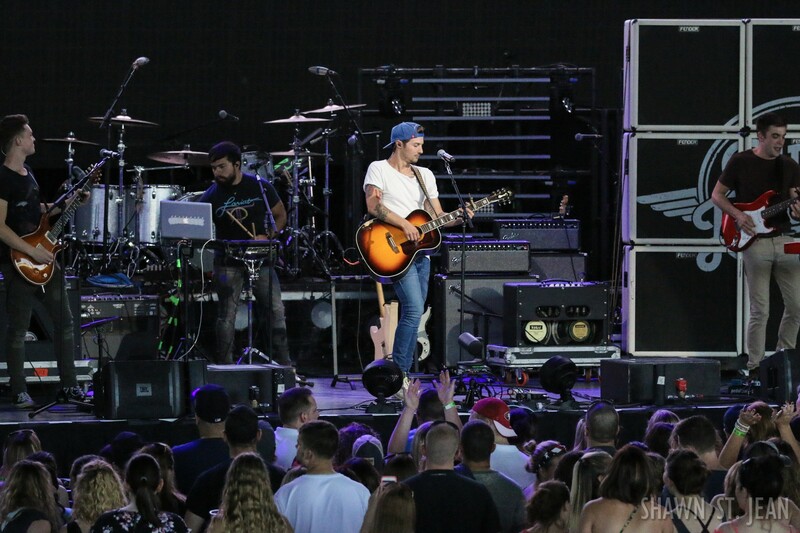 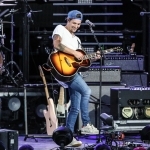 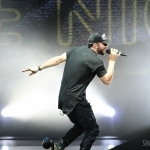 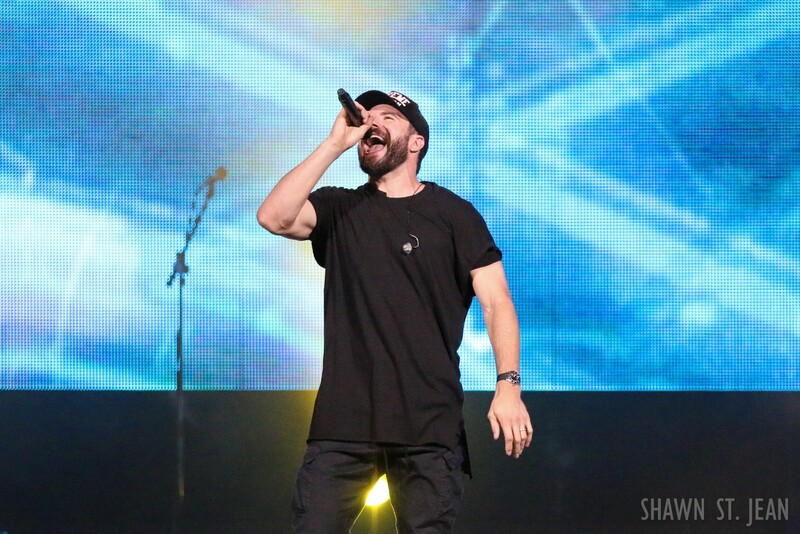 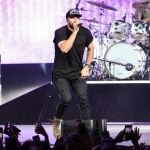 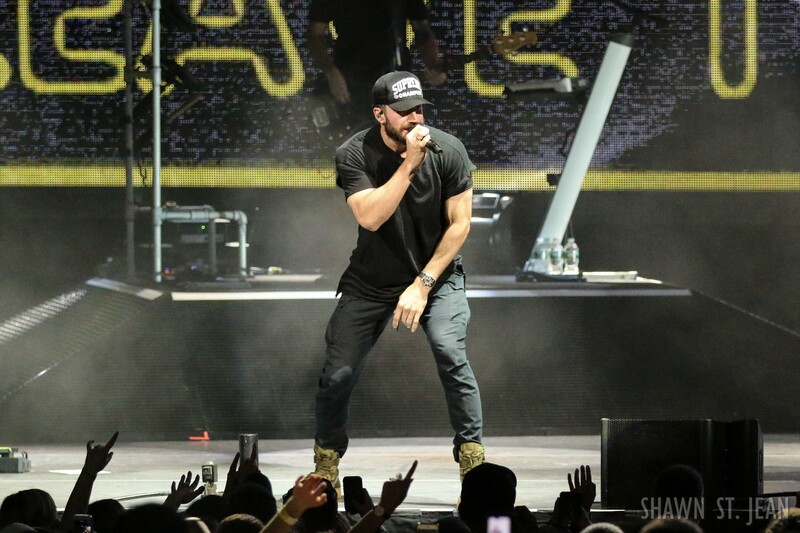 Taking a line from his latest mega-hit single Body Like A Back Road, Sam Hunt brought his 15 in a 30 Tour to the Xfinity Theatre on June 24, 2017. 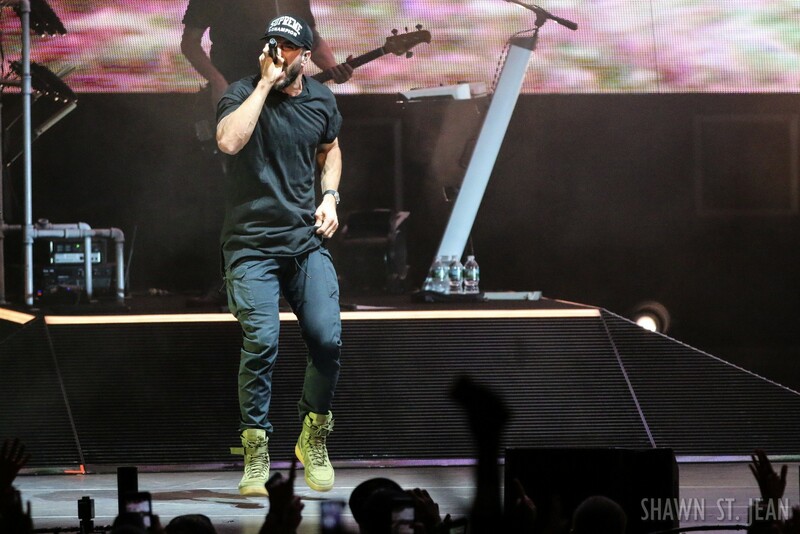 Hartford marked Hunt’s 5th sold out performance out of the first seven stops on this tour. 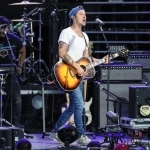 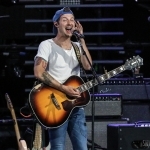 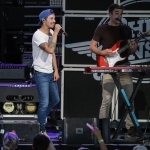 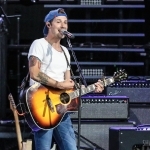 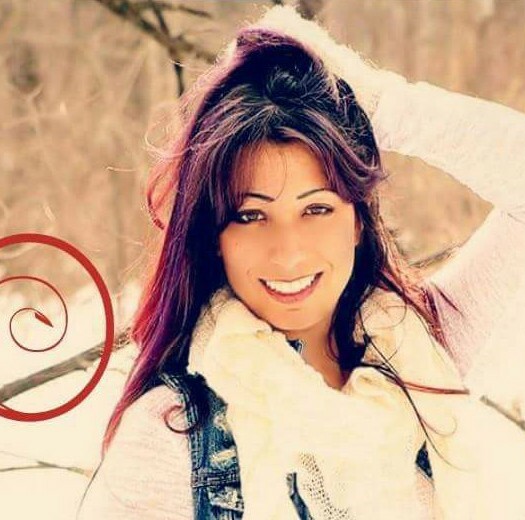 Hunt last appeared at Xfinity two years ago opening for Lady Antebellum with Hunter Hayes. 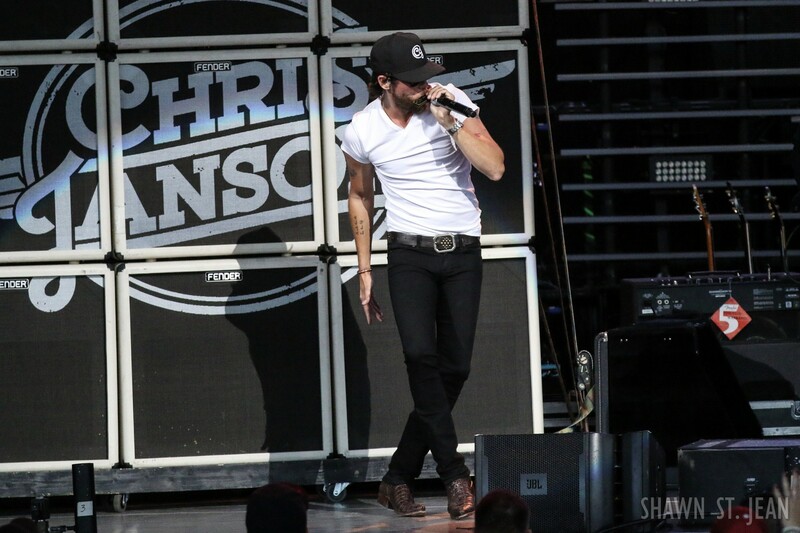 As the lights went down just after 9:30pm, a huge ’15 IN A 30′ lit up the stage. 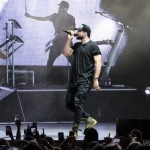 The crowd erupted as Hunt appeared, sporting a black shirt and pants, a black Supreme Champion snapback and and a pair of olive green Nike Special Field Air Force 1s. 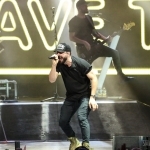 While the theme of the tour may be all about going slow, Hunt kicked off his set with a couple of high energy fan favorites, Leave The Night On and House Party, with the latter seeing Hunt leap off the stage and do a lap around the theater. 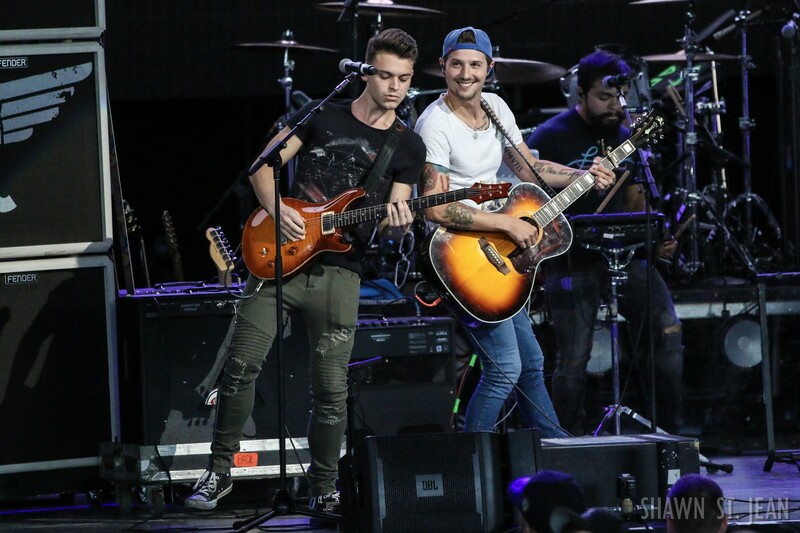 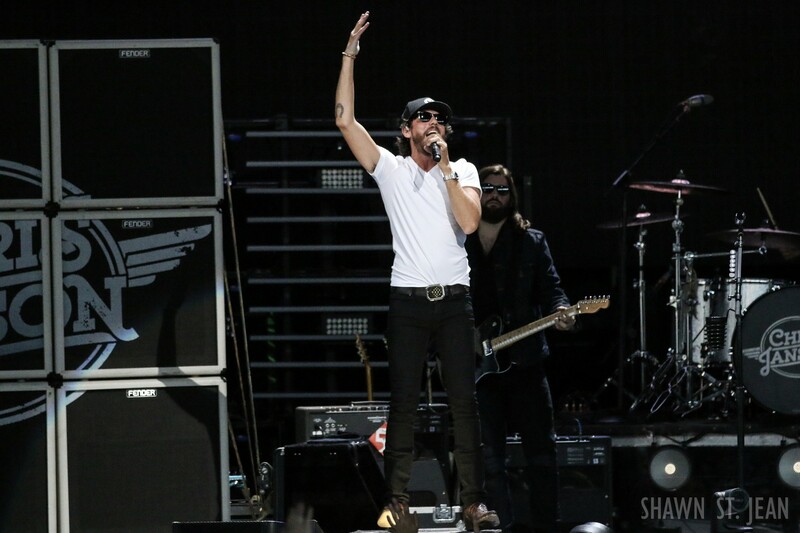 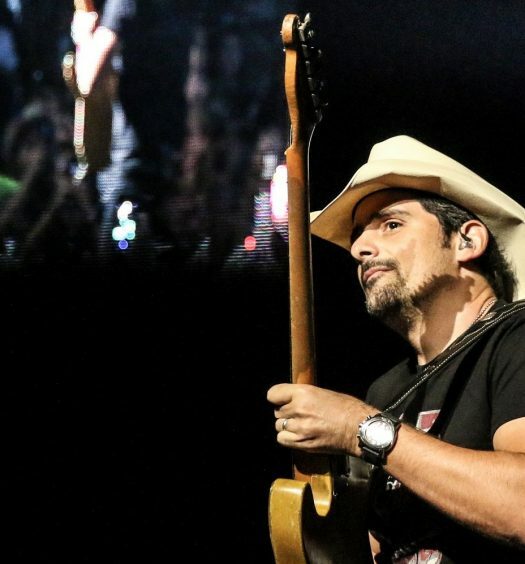 The night included some of Hunt’s biggest songwriting credits that have been recorded by other artists like Keith Urban’s Cop Car, William Michael Morgan’s I Met A Girl, and Billy Currington’s We Are Tonight. 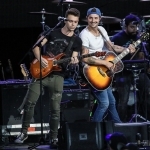 He singled out Currington as having made a real difference in his life a few years ago by putting enough change in his pocket to keep his band fed and enough gas in the tank to stay out on the road. 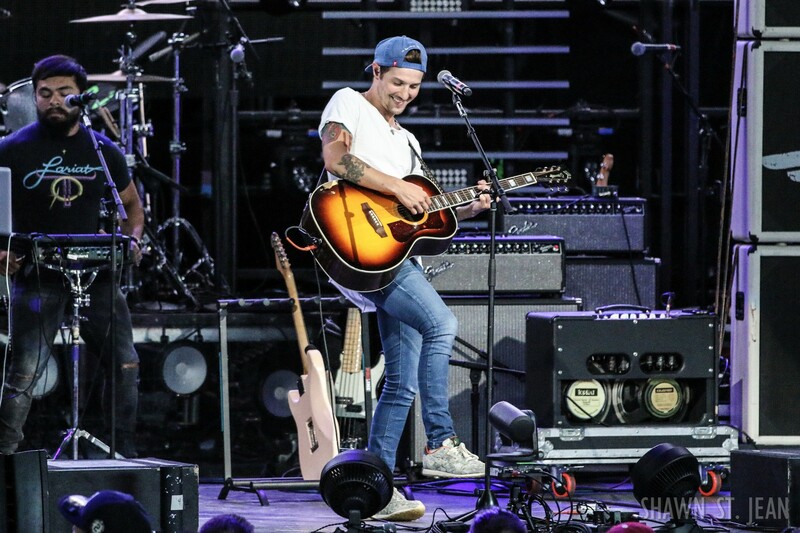 Mid-way through his set, Hunt did slow it down a bit as he sat on a stool center stage with his guitar and told the crowd that he wanted to chat. 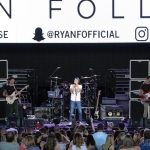 The large light boards that made up the backdrop to the stage folded in to make the space around him tighter, feeling more like an intimate acoustic setting in a small club. 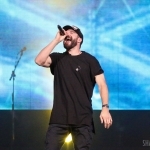 Over the course of his career, Hunt has seen plenty of praise as well as criticism for his genre-bending style. 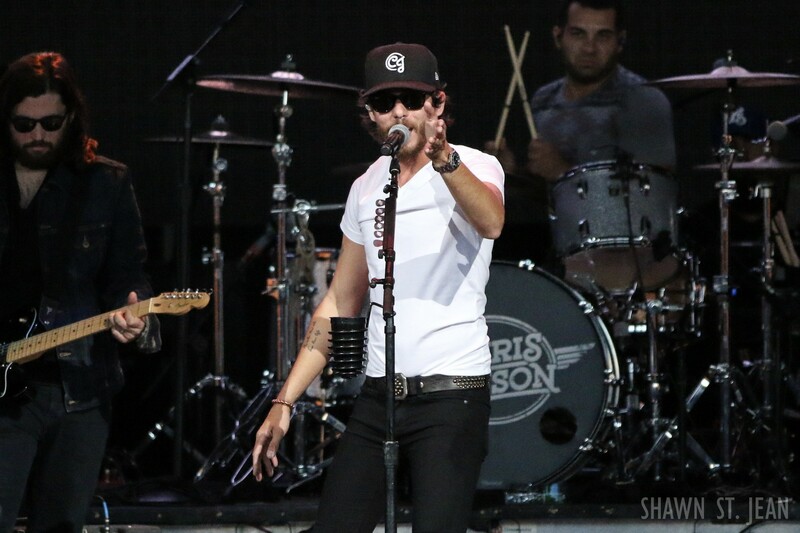 Tonight he wanted to set the record straight for his fans, letting them know how it all began. 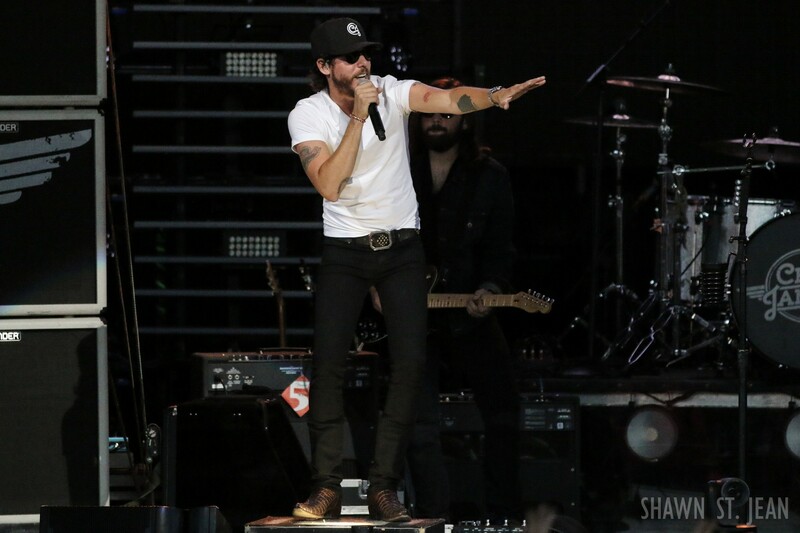 Talking about country music, Hunt said, “Where I’m from, that’s it, that’s what everybody listens to, that’s the culture I was born into. 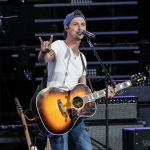 When I was growin’ up, I couldn’t tell you the difference between Nirvana and Madonna, but I knew every Alan Jackson song that he ever put out.” That was met with huge cheers from the crowd. 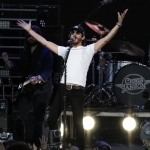 Hunt went on to describe what his childhood was like, from playing football, to going to church, to Sunday afternoons at his grandmother’s house. 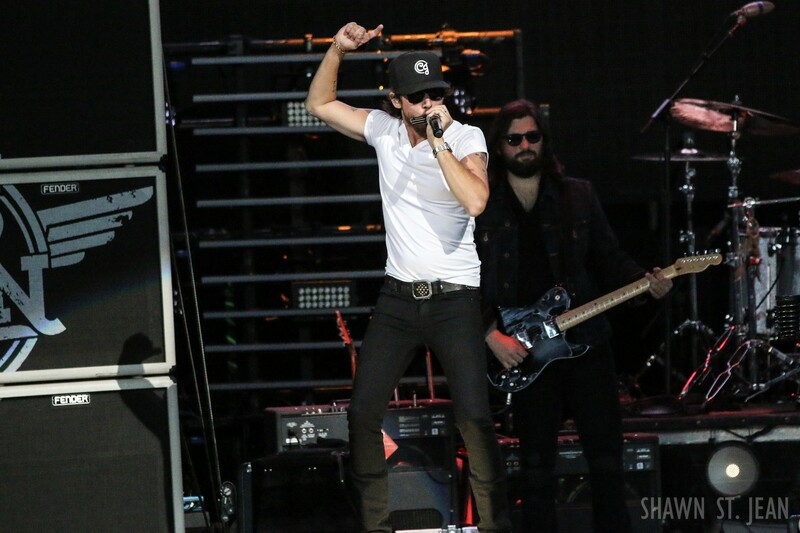 The one constant throughout was that country music provided the soundtrack. 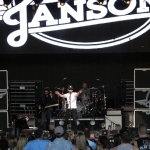 Hunt then broke into a little bit of Alan Jackson’s Don’t Rock The Jukebox. 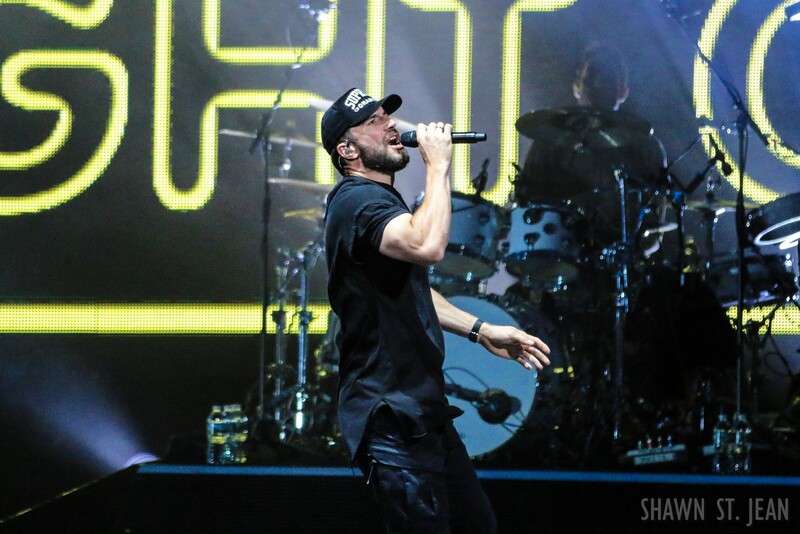 As Hunt grew up, he started hanging out with his older cousins, and driving around they’d be listening to R&B artists like Usher. 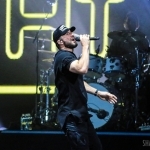 Hunt said he knew he was “predestined to love R&B music” the first time he heard Usher’s Nice & Slow, which he played a piece of for the crowd. 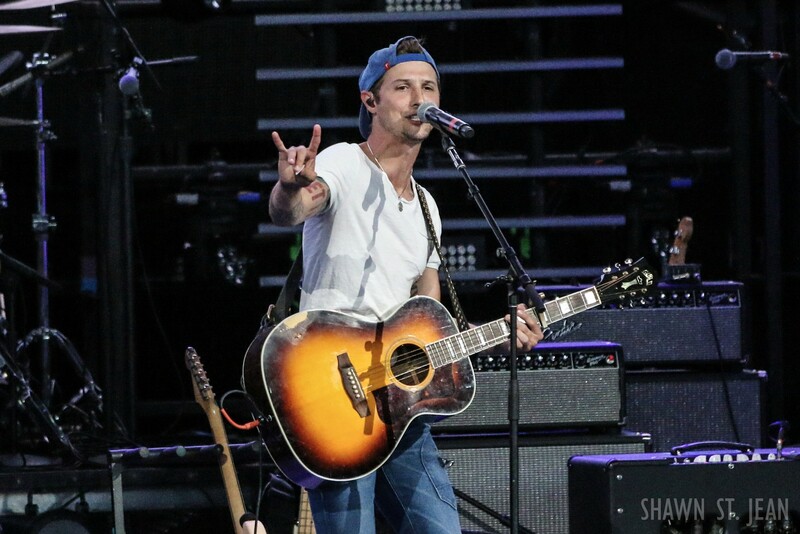 When Hunt got to Nashville and started writing songs it was the country and R&B influences that came out. 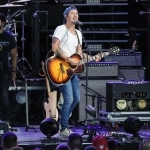 “All the music business folks up in Nashville, they said, man this just isn’t country – it’s not country enough, it’s not gonna work,” Hunt said. 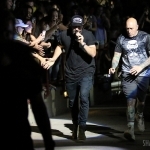 “But thankfully, by the grace of God, one of the fellas that I’d been ridin’ around listenin’ to for years before, Kenny Chesney, came along and he heard one of these songs that I’d written.” Hunt was talking about Come Over, and said that when he heard Chesney perform it for the first time on the radio he knew that he had to make a record of his own. 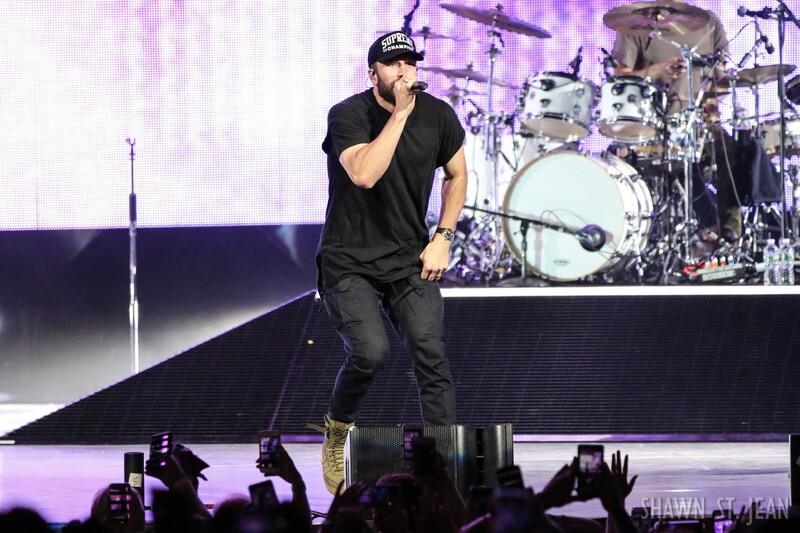 Hunt concluded his monologue by highlighting the commonality of people in America and how culturally integrated our country is today. 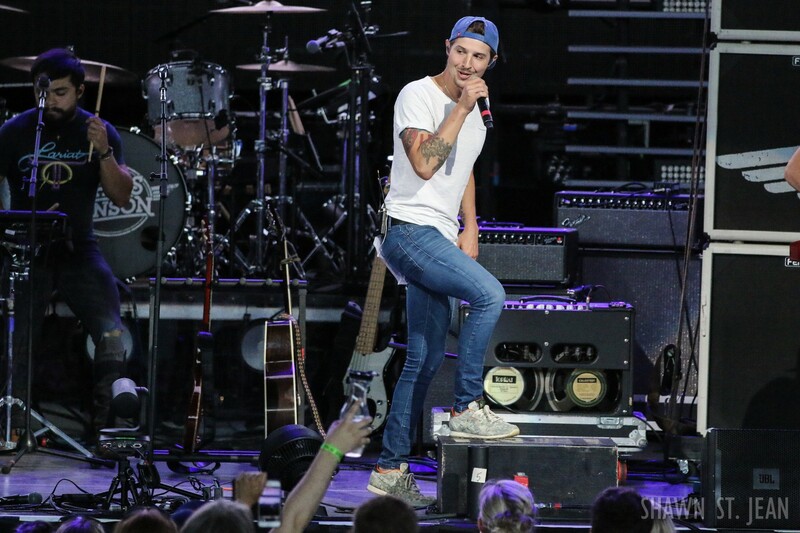 “You guys, y’all don’t pay attention to genres of music, you don’t pay attention to genres of people,” Hunt explained. 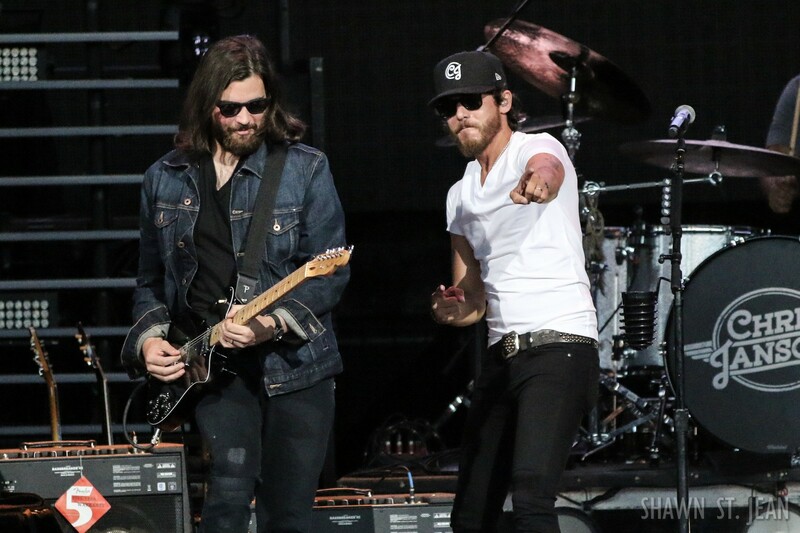 “You listen to what makes you feel good and you hang out with people you like, not people who look like you. 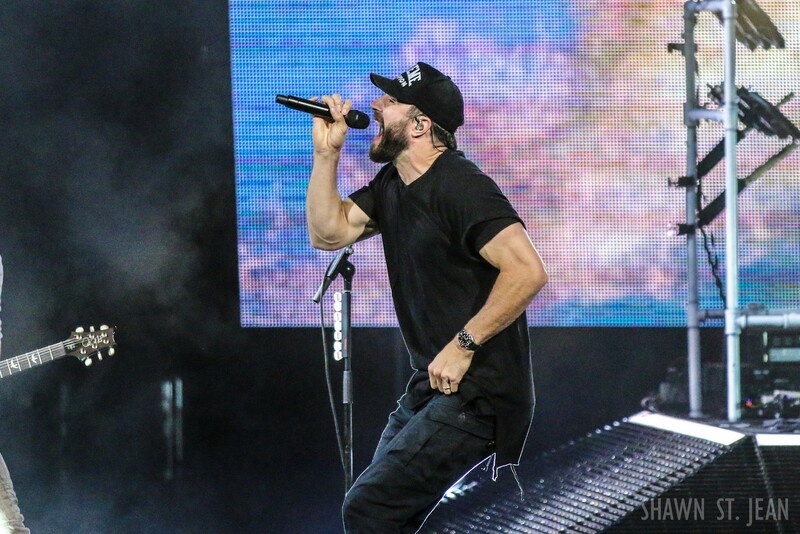 And I’m tellin’ you, when this generation takes over, and it’s already happenin’, y’all are gonna tear down some of the walls that have divided people in this country for a long time. 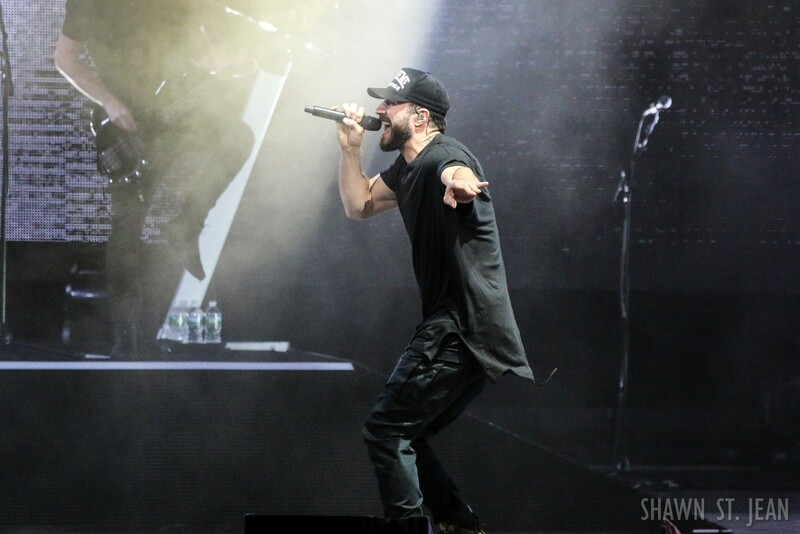 And I say that because I want you to know the power you have. 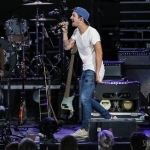 I believe that with all my heart.” The crowd seemed to be in complete agreement as it erupted in cheers. 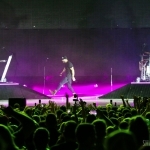 That high level of energy was evident throughout the night as the capacity crowd stayed on its feet for his entire set. 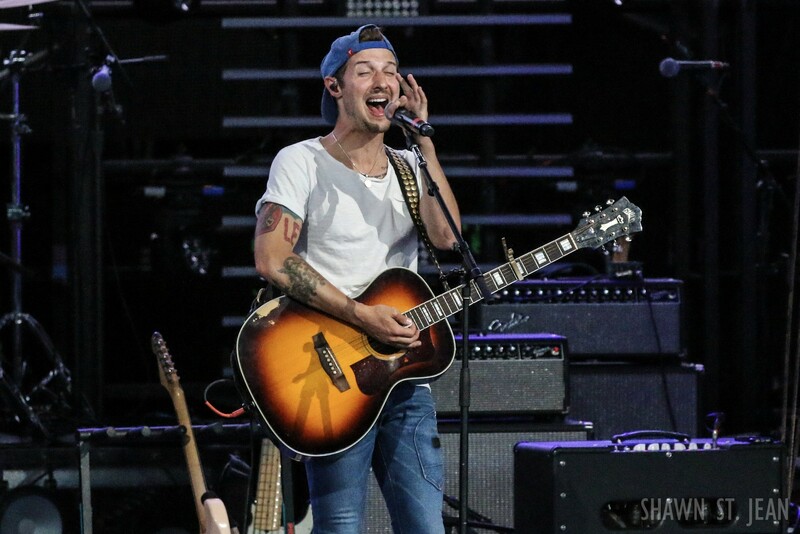 And Hunt was clearly feeding off that energy, looking genuinely happy with a big smile as over 24,000 fans sang his lyrics back to him. 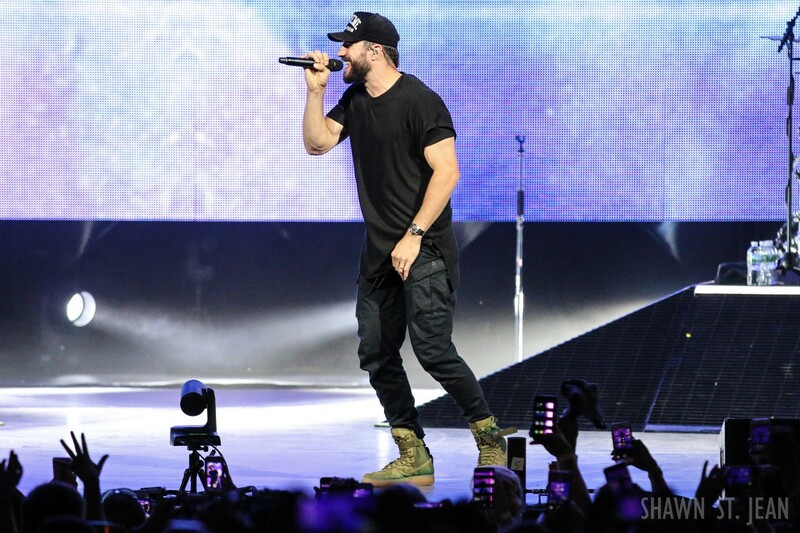 The biggest sing-along of the night came when Hunt performed what has clearly been the hottest country song of 2017, Body Like A Back Road. 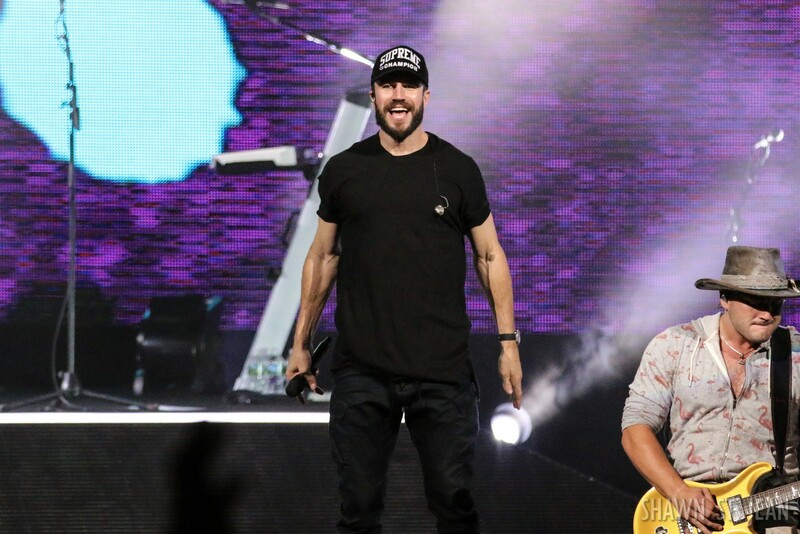 With the amount of time this latest single has spent at the top of the charts, it’s no wonder that the crowd knew every word. 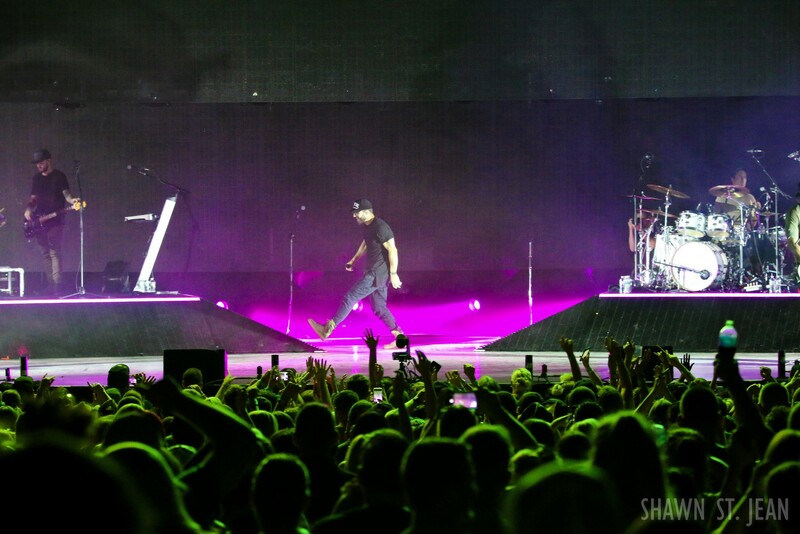 For his encore Hunt started off solo on piano with a stunning performance of Make You Miss Me, and got everyone fired up with the finale Break Up in a Small Town. 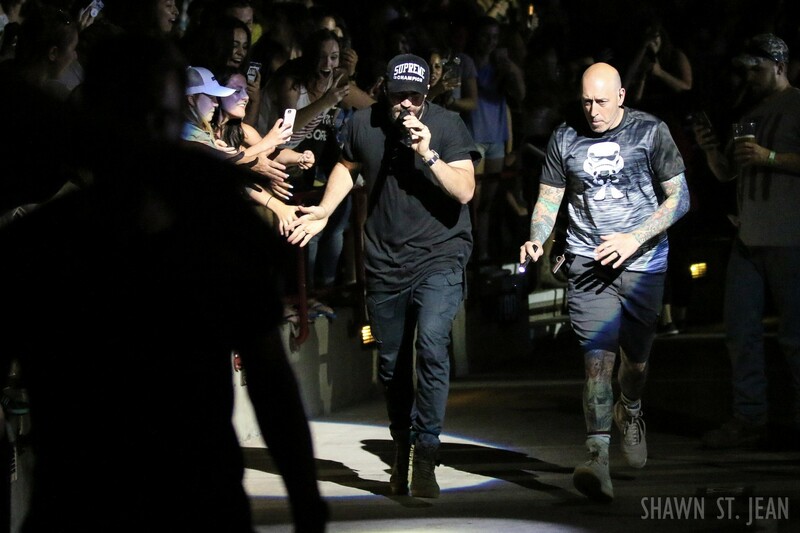 At the end of a show, some artists may reach down from the stage and shake a few hands, maybe sign a few autographs. 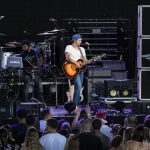 Hunt opted for a more personal approach, jumping down in to the pit, meeting as many people as he could as Alan Jackson’s Don’t Rock The Jukebox played in the background. 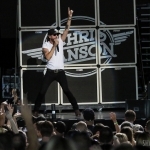 The 15 in a 30 Tour returns to the Tri State area with a stop at Madison Square Garden on September 14th. 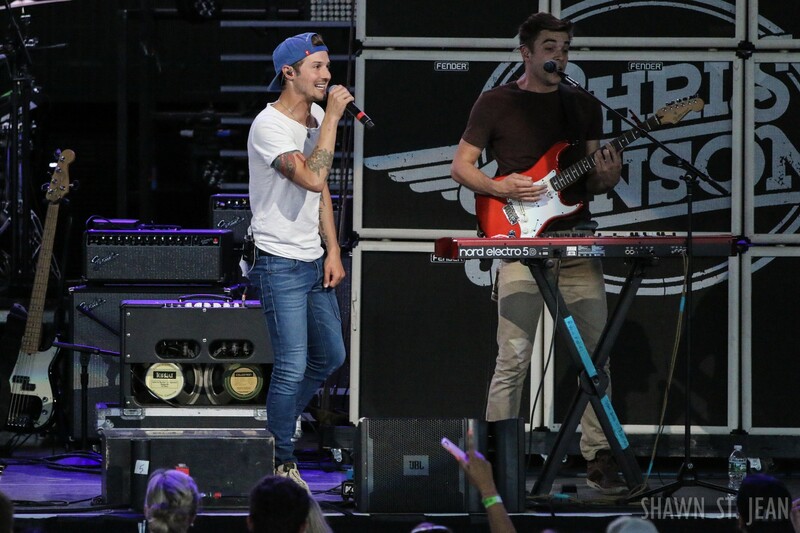 Were you at the show in Hartford or have you seen Sam perform live elsewhere? 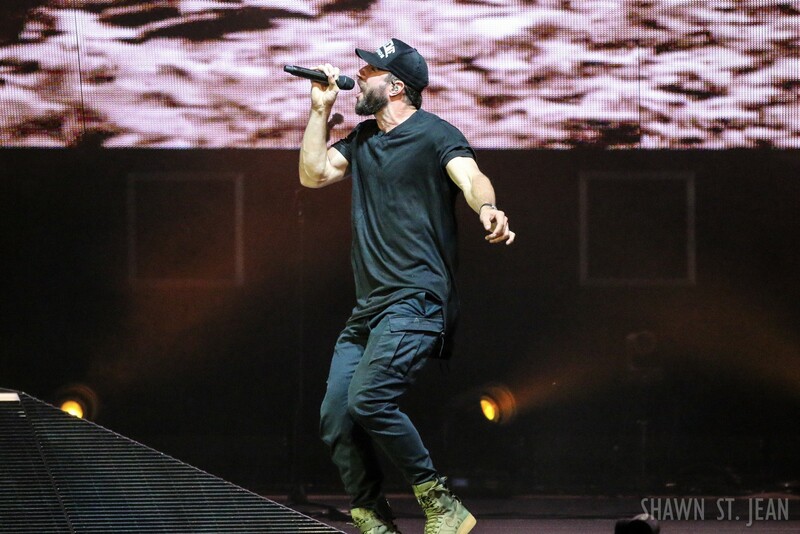 Let us know what you thought of his performance in the comments section below!